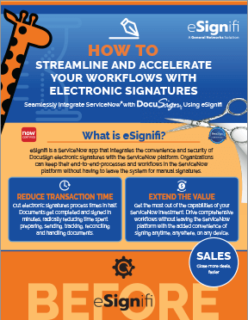 eSignifi adds the convenience and security of electronic signatures to your ServiceNow platform. It allows designers and developers to include eSignature steps in new or existing ServiceNow workflows. eSignifi streamlines business processes in Human Resources, IT Service Management, Customer Service, Service Catalog, IT Security, Procurement and more. 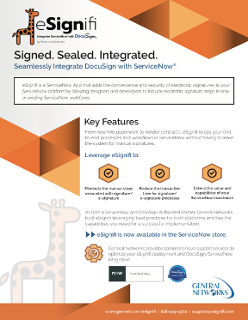 As both a ServiceNow and DocuSign Authorized Partner, General Networks built eSignifi leveraging best practices for both platforms and has the capabilities you need for a successful implementation.